We are delighted to announce that ScaleFocus is the winner in the European Service Provider of the Year: SME category at the 2016 Global Sourcing Association (GSA) Awards. The award was accepted by our CEO Plamen Tsekov at the ceremony on October 6th in Sofia, Bulgaria. 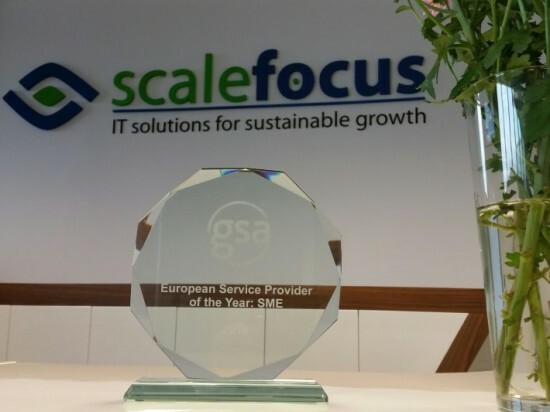 This is a great recognition for ScaleFocus’ services on the European market. We are thrilled that our investments into opening offices in UK and Germany, forging strong partnerships and constantly working for service delivery excellence have brought recognition from a global association. This is a significant contribution to ScaleFocus’ positioning as one of the top IT consulting and outsourcing supplier, differentiating with edge and quality! This award solidifies our courage to continue investing into our spread to the European market and speeds-up the plans for expansion in North America. This year’s GSA European Sourcing Summit and Awards were held in Sofia, capital of the Republic of Bulgaria, following last year’s double recognition as ‘Offshoring Destination of the Year’ by the NOA UK and EOA of Bulgaria. The President of Bulgaria Mr. Rosen Plevneliev was delighted to give an opening speech and thank GSA for choosing Sofia as destination for the summit and congratulate the GSA team for the event’s professional organization. Mr. Bojidar Loukarsky, Minister of the Economy of the Republic of Bulgaria also addressed the importance of the sourcing industry to the Bulgarian Economy and the steps of the country is taking to strengthen its proposition as an outsourcing destination. This year, the GSA Awards (held for the 7th consecutive year) selected and distinguished the efforts of companies and countries who have demonstrated best-practices in Pan-European and world sourcing. The Awards (previously targeted as NOA and EOA awards) are a great global label for quality and appreciation and it is an honour for our company to be recognized amongst the top IT and consulting firms!